Paracentesis is a procedure in which a needle is advanced into a pocket of ascitic fluid and removed for diagnostic and/or therapeutic purposes. It is typically performed at the bedside with transabdominal ultrasound guidance in a safe and effective manner. Paracentesis is a cornerstone of therapy for any practitioner who cares for patients with chronic liver disease and/or abdominal malignancy. EUS-FNA of pleural and ascitic fluid was first described in 1995, with the first large series following in 2001. Ensuing studies have shown that the EUS-guided approach has numerous unique benefits. EUS is more sensitive for the detection of ascites than other diagnostic measures including computed tomography, ultrasound, and physical examination.,, With EUS-guided paracentesis (EUS-P), even small amounts of fluid (as little as 2.7 mL) can yield valuable diagnostic information in patients with omental caking and thick peritoneal deposits, the EUS-guided approach can still be easily performed to access otherwise compartmentalized pockets of fluid that would be challenging to drain by the transabdominal approach. As such, EUS-P should be part of the armamentarium of any gastroenterologist trained in EUS. Ascites can be secondary to either benign or malignant processes; however, historically, ascites has been categorized into etiologies secondary to portal hypertension and those which are not secondary to portal hypertension. While the differential for ascites can be broad, as many as 80% of cases are ultimately attributed to cirrhosis and portal hypertension. In these patients, a complex relationship between a variety of circulatory, vascular, functional, and biochemical abnormalities all contributes to the accumulation of excess peritoneal fluid. The remaining cases of ascites are attributed to a variety of etiologies including cardiac ascites (secondary to heart failure or constrictive pericarditis), hypoalbuminemia, or peritoneal disease, including malignancy-related ascites. For the endoultrasonographer, malignancy-related ascites probably represents the second most commonly encountered etiology after portal hypertension-related ascites. While peritoneal carcinomatosis represents the bulk of malignant ascites (up to 66%), malignant processes can also cause ascites by means of overwhelming hepatic involvement and subsequent portal hypertension, chylous ascites secondary to lymphatic occlusion, or by hepatic vein occlusion (Budd–Chiari syndrome). In this fashion, a variety of malignant processes, including ovarian, urinary bladder, colorectal, gastric, hepatocellular, breast, pancreatic, lung cancer, or lymphoma, can all be implicated in malignancy-related ascites. In patients with underlying liver disease, ascites is a common first indication of a primary hepatocellular carcinoma. It is at least partially for this reason and for the insidious fashion in which spontaneous bacterial peritonitis (SBP) presents that it is recommended that diagnostic paracentesis should be performed in any patient with new ascites. As many as 13% of patients with SBP have no systemic signs of infection. Any patient with a history of ascites who is admitted to the hospital should undergo paracentesis, as should any patient with ascites who suffers a decompensating event, including abdominal pain, fever, hepatic encephalopathy, unexplained leukocytosis, or acute kidney injury. Adherence to these principles may improve overall mortality among hospitalized patients with cirrhosis and ascites. As an example, in one study of 239 patients diagnosed with SBP, delayed paracentesis >12 h after presentation was associated with a 2.7-fold increase in in-hospital mortality. Given the urgency of obtaining a diagnostic paracentesis when indicated in patients with underlying liver disease, it may not be practical to consider EUS-P as a front-line procedure for all such patients. Compared to bedside transabdominal paracentesis, the EUS approach is relatively more invasive and complex, and an overreliance on EUS-P for the diagnosis of SBP may result in unnecessary and potentially dangerous delays in care. However, malignancy-related etiologies are responsible for up to 7% of all causes of ascites. In such cases, EUS-P can provide valuable diagnostic information regarding the presence of malignant ascites with a robust sensitivity, specificity, positive predictive, and negative predictive value (94%, 100%, 100%, and 89%, respectively). This information provides a critical aspect of preoperative staging and valuable prognostic information. In one retrospective study of 11 patients, Suzuki et al. described the use of a specialized spring-loaded 22G FNA needle for EUS-P 100% success rate and no complications. The authors speculate that such a spring-loaded mechanism may be of particular benefit in overcoming the lax and mobile gastrointestinal wall. This lax effect may be more pronounced with EUS-P, as the sampling of peritoneal fluid lacks the extramural counterforce conventionally present with the FNA of a solid lesion. While in theory, the use of a spring-loaded needle could improve the ease of EUS-P, in practice and in the literature, traditional EUS-FNA needles (including 25G and 22G needles) have been used with good success and can be cost-effective than more complicated, less widely available spring-loaded needles. It is reasonable in cases in which therapeutic paracentesis is performed to use a larger caliber needle if technically feasible, as the larger caliber will facilitate more rapid exchange of fluid. The technical features of the EUS-P approach are similar to that of pancreatic cyst drainage. As reported in the earliest cases describing the technique, the EUS needle should be advanced into the fluid collection and negative pressure used to aspirate the desired amount of fluid  [Figure 1]. In cases of diagnostic paracentesis, negative pressure can be achieved with syringe suction. For cases in which therapeutic paracentesis is desired, a suction tube attached to a vacuum canister is described. To-and-fro motion is not required, but repositioning may be required if the needle becomes occluded by omentum. To avoid contamination, the special attention should be used to ensure that any suspected primary tumor should not be transversed during the FNA. As with transabdominal paracentesis, EUS-P is generally safe and carries little additional risk beyond that conventionally associated with any endoscopy. Many patients undergoing paracentesis suffer from cirrhosis and the sequelae of portal hypertension, including coagulopathy and thrombocytopenia. As per the AASLD guidelines on the management of patients with ascites, for transabdominal ultrasound-guided paracentesis, bleeding complications are uncommon, even in those with profound thrombocytopenia (as low as 19,000 cells/mm 3) or international normalized ratios for prothrombin time of 8.7. There are little data to describe the risks of bleeding with EUS-P; however, as the ASGE classifies EUS-FNA as a “high-risk” procedure for bleeding, EUS-P may not be appropriate for patients with a higher risk for bleeding complications. As with transabdominal paracentesis, should large volume therapeutic paracentesis be performed with the EUS-guided approach, one should be cautious about the risk of intravascular depletion and subsequent kidney injury. AASLD guidelines suggest that the administration of 6–8 g per liter of fluid removed when more than 5 L of ascitic fluid was removed. This practice may yield a reduction in overall mortality, with one meta-analysis showing an odds ratio of death of 0.64 (95% confidence interval, 0.41–0.98) in those patients who received albumin. Transabdominal paracentesis is usually performed under sterile conditions, with the abdominal site prepped with an antiseptic solution such as povidone–iodine or chlorhexidine. One concern specific to the EUS-guided approach is the lack of any such sterile conditions when transluminal access of the peritoneum is achieved. Few studies exist describing the rates of infectious complications among patients undergoing EUS-P. In one series, 2/60 (3.3%) of patients who underwent the procedure developed self-limited fevers. In another, 1/25 patients developed bacterial peritonitis. It may be reasonable to draw corollaries to EUS-FNA of pancreatic cystic lesions, in which some studies show a <1% risk of infectious complications in the absence of antimicrobial prophylaxis. Nevertheless, antimicrobial prophylaxis does make up part of the ASGE guidelines for patients undergoing FNA of pancreatic cystic lesions. 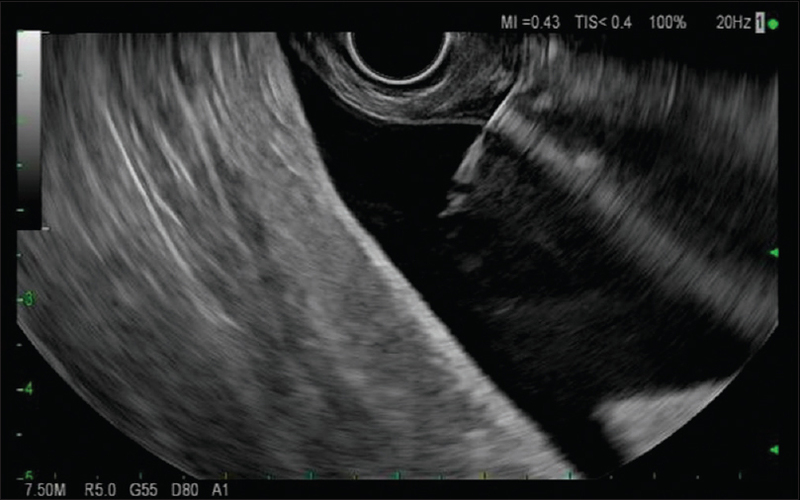 While appropriate ascitic fluid testing is individualized to the clinical scenario at hand, the most frequently addressed question is whether portal hypertension is present. The serum-to-ascites gradient (SAAG) is calculated by subtracting the serum albumin from the ascitic fluid albumin. A high SAAG (≥1.1 g/dL) can predict the presence of portal hypertension with 97% accuracy. In addition to cirrhosis, such portal hypertension-related ascites can be secondary to alcoholic hepatitis, heart failure, massive hepatic metastases, or vascular anomalies such as Budd–Chiari syndrome or portal vein thrombosis. A low SAAG (<1.1 g/dL) can indicate ascites secondary to peritoneal carcinomatosis, peritoneal tuberculosis, pancreatitis, or nephrotic syndrome. The presence of infection should be definitively evaluated for with every paracentesis, even in those with low clinical suspicion, as peritonitis can be associated with dramatic morbidity and mortality in all patients with ascites. Rather than waiting for cultures, a cell count and differential can be rapidly available and can accurately differentiate between sterile and infected fluid. A corrected neutrophil count of ≥250/mm 3 (in which one neutrophil is subtracted from the absolute neutrophil count for every 250 red blood cells ) is indicative of infection and should be treated immediately with antibiotics. SBP, in which there is no evident surgically treatable source of peritonitis, occurs largely in patients with cirrhosis and ascites. In such cases, Escherichia coli and Klebsiella are most commonly implicated; broad-spectrum antibiotics (such as a third-generation cephalosporin or fluoroquinolone) are recommended pending culture results. It is important to differentiate SBP from secondary bacterial peritonitis, in which a surgically treatable cause of peritonitis (such as a perforated peptic ulcer or perinephric abscess) can be identified. The mortality of secondary bacterial peritonitis approaches 100% if no surgical intervention is pursued. Secondary bacterial peritonitis can be suggested by an ascitic fluid protein >1 g/dL, glucose <50 mg/dL, lactate dehydrogenase (LDH) greater than the upper limit of normal for serum, or polymicrobial infection., Such tests are no substitute for a high index of clinical suspicion. There is no shortage of other chemistries which can be run on ascitic fluid, with the clinical situation dictating which tests are most appropriate. Ascitic fluid total protein concentration is a reasonable test in patients with suspected ascites secondary to cirrhosis, as the value inversely correlates with the risk of developing SBP. AASLD guidelines suggest that patients with a total protein of <1.5 g/dL in addition to either impaired renal function or liver failure should be given antibiotic prophylaxis for SBP. The ascitic fluid glucose concentration can be depressed by a high concentration of neutrophils or malignant cells and can be low (approaching <50 mg/dL) when peritonitis or peritoneal carcinomatosis is present., Similarly, LDH released by lysed neutrophils can be significantly elevated (when compared to the upper limit of normal for one's local laboratory) in cases of peritonitis. An elevated ascitic amylase (>5 times the upper limit of normal) can indicate pancreatitis or perforation., Should peritoneal fluid appear grossly milky, a triglyceride concentration >200 mg/dL indicates chylous ascites. EUS-P is frequently performed to evaluate for the presence or absence of malignancy-related ascites. In such cases, ascitic fluid cytology should be ordered. Nearly 100% of patients with peritoneal carcinomatosis will have positive ascitic fluid cytology; however, it is important to remember that only 60% of patients with malignancy-related ascites will have peritoneal carcinomatosis. The overall sensitivity of cytology for the detection of malignant ascites is 58%–75%. The measurement of ascitic fluid carcinoembryonic antigen has been proposed as a tool to evaluate for malignancy-related ascites, however, remains unvalidated. EUS-P is safe and effective and presents many benefits over traditional transabdominal ultrasound. Many of the skills learned through traditional EUS-FNA translate well into effective EUS-P technique. The diagnostic interpretation of ascitic fluid testing is a cornerstone of gastroenterology. As such, EUS-P should be considered part of standard practice for any endosonographer. Chang KJ, Albers CG, Nguyen P. Endoscopic ultrasound-guided fine needle aspiration of pleural and ascitic fluid. Am J Gastroenterol 1995;90:148-50. Nguyen PT, Chang KJ. EUS in the detection of ascites and EUS-guided paracentesis. Gastrointest Endosc 2001;54:336-9. Lee YT, Ng EK, Hung LC, et al. Accuracy of endoscopic ultrasonography in diagnosing ascites and predicting peritoneal metastases in gastric cancer patients. Gut 2005;54:1541-5. DeWitt J, LeBlanc J, McHenry L, et al. Endoscopic ultrasound-guided fine-needle aspiration of ascites. Clin Gastroenterol Hepatol 2007;5:609-15. Varadarajulu S, Drelichman ER. EUS-guided therapeutic paracentesis. Gastrointest Endosc 2008;67:758-9. Runyon BA. Care of patients with ascites. N Engl J Med 1994;330:337-42. Solà E, Ginès P. Renal and circulatory dysfunction in cirrhosis: Current management and future perspectives. J Hepatol 2010;53:1135-45. Runyon BA, Hoefs JC, Morgan TR. Ascitic fluid analysis in malignancy-related ascites. Hepatology 1988;8:1104-9. Runyon BA; AASLD. Introduction to the revised American Association for the Study of Liver Diseases Practice Guideline management of adult patients with ascites due to cirrhosis 2012. Hepatology 2013;57:1651-3. Runyon BA. Monomicrobial nonneutrocytic bacterascites: A variant of spontaneous bacterial peritonitis. Hepatology 1990;12:710-5. Orman ES, Hayashi PH, Bataller R, et al. Paracentesis is associated with reduced mortality in patients hospitalized with cirrhosis and ascites. Clin Gastroenterol Hepatol 2014;12:496-503.e1. Kim JJ, Tsukamoto MM, Mathur AK, et al. Delayed paracentesis is associated with increased in-hospital mortality in patients with spontaneous bacterial peritonitis. Am J Gastroenterol 2014;109:1436-42. Runyon BA, Montano AA, Akriviadis EA, et al. The serum-ascites albumin gradient is superior to the exudate-transudate concept in the differential diagnosis of ascites. Ann Intern Med 1992;117:215-20. Kaushik N, Khalid A, Brody D, et al. EUS-guided paracentesis for the diagnosis of malignant ascites. Gastrointest Endosc 2006;64:908-13. Montgomery MM, Leitman IM. Endoscopic ultrasound and paracentesis in the evaluation of small volume ascites in patients with intra-abdominal malignancies. World J Gastroenterol 2014;20:10219-22. Suzuki R, Irisawa A, Bhutani MS, et al. An automated spring-loaded needle for endoscopic ultrasound-guided abdominal paracentesis in cancer patients. World J Gastrointest Endosc 2014;6:55-9. Adler DG, Conway JD, Coffie JM, et al. EUS accessories. Gastrointest Endosc 2007;66:1076-81. Wardeh R, Lee JG, Gu M. Endoscopic ultrasound-guided paracentesis of ascitic fluid: A morphologic study with ultrasonographic correlation. Cancer Cytopathol 2011;119:27-36. Grabau CM, Crago SF, Hoff LK, et al. Performance standards for therapeutic abdominal paracentesis. Hepatology 2004;40:484-8. ASGE Standards of Practice Committee, Acosta RD, Abraham NS, et al. The management of antithrombotic agents for patients undergoing GI endoscopy. Gastrointest Endosc 2016;83:3-16. Bernardi M, Caraceni P, Navickis RJ, Wilkes MM. Albumin infusion in patients undergoing large-volume paracentesis: A meta-analysis of randomized trials. Hepatology 2012;55:1172-81. Guarner-Argente C, Shah P, Buchner A, et al. Use of antimicrobials for EUS-guided FNA of pancreatic cysts: A retrospective, comparative analysis. Gastrointest Endosc 2011;74:81-6. ASGE Standards of Practice Committee, Khashab MA, Chithadi KV, et al. Antibiotic prophylaxis for GI endoscopy. Gastrointest Endosc 2015;81:81-9. Such J, Runyon BA. Spontaneous bacterial peritonitis. Clin Infect Dis 1998;27:669-74. Hoefs JC. Increase in ascites white blood cell and protein concentrations during diuresis in patients with chronic liver disease. Hepatology 1981;1:249-54. Runyon BA, Antillon MR. Ascitic fluid pH and lactate: Insensitive and nonspecific tests in detecting ascitic fluid infection. Hepatology 1991;13:929-35. Akriviadis EA, Runyon BA. Utility of an algorithm in differentiating spontaneous from secondary bacterial peritonitis. Gastroenterology 1990;98:127-33. Runyon BA, Hoefs JC. Ascitic fluid analysis in the differentiation of spontaneous bacterial peritonitis from gastrointestinal tract perforation into ascitic fluid. Hepatology 1984;4:447-50. Soriano G, Castellote J, Alvarez C, et al. Secondary bacterial peritonitis in cirrhosis: A retrospective study of clinical and analytical characteristics, diagnosis and management. J Hepatol 2010;52:39-44. Runyon BA. Low-protein-concentration ascitic fluid is predisposed to spontaneous bacterial peritonitis. Gastroenterology 1986;91:1343-6. Runyon BA, Hoefs JC. Ascitic fluid chemical analysis before, during and after spontaneous bacterial peritonitis. Hepatology 1985;5:257-9. Runyon BA. Amylase levels in ascitic fluid. J Clin Gastroenterol 1987;9:172-4. Press OW, Press NO, Kaufman SD. Evaluation and management of chylous ascites. Ann Intern Med 1982;96:358-64. DiBonito L, Falconieri G, Colautti I, et al. The positive peritoneal effusion. A retrospective study of cytopathologic diagnoses with autopsy confirmation. Acta Cytol 1993;37:483-8. Loewenstein MS, Rittgers RA, Feinerman AE, et al. Carcinoembryonic antigen assay of ascites and detection of malignancy. Ann Intern Med 1978;88:635-8.